Photo-dependent localized color development in the eastern box turtle carapace. Since 1993 we have conducted long-term field studies (Belzer and Seibert 2007a) on potential methods to augment recruitment in eastern box turtle (Terrapene carolina carolina) populations in northwestern Pennsylvania. We described our field sites in Belzer and Seibert (2009a). We use head started juveniles (Belzer and Seibert 2007b) for some aspects of the investigation. Our first attempts at head starting box turtle hatchlings did little more than demonstrate how susceptible small (30-50g) box turtles are to predation (Belzer et al. 2002). Yahner (1974) and Murphy (1976) reported that after juvenile box turtles surpass about 250g, they are no more susceptible to predation than are adults. We therefore adopted a modification (Belzer and Seibert 2007b) of the indoor headstarting method of Kathy Michell (New York Center for Turtle Rehabilitation and Conservation) which produces juveniles of approximately 250g within 2 years. This report shares our observations on carapace color development gathered during our first 7 years of headstarting box turtle hatchlings. During our 2-year indoor headstart protocol (Belzer and Seibert 2007b), scant color developed in the juveniles' carapaces. Even after our turtles surpassed 250g and were ready for release, their carapaces were generally colored with little more than different shades of tan (Figs.1A, 2A, 4A, 5A, 6A, 7A, 8A, 9A, and 10A ) and none of the bright yellows common among native eastern box turtles (Fig. 3). That color deficiency made us wonder if other physiological functions (e.g., immunity) were also hindered by our headstarting conditions. We were relieved to find that not only were our headstarted juveniles healthy after their first year in the wild (and remain so to this day, 6 years later, Belzer and Seibert 2007b), but that their carapaces had started to develop the bright patterns (Figs. 1B, 2B, and 4B) typical of this species. This observation suggested that something found in the natural habitat, missing from our headstarting environment, is needed to promote carapace pigment production. Alternatively, maybe carapace color development in this species is an age-related phenomenon that begins at about 2 years. Perhaps the start of our juveniles' life in wild habitat simply coincided with color development that would have started regardless of environment. Because our headstarting protocol (Belzer and Seibert 2007b) varies slightly from Kathy Michell's, we were able to distinguish between these two hypotheses. Unlike us, Kathy puts her headstarted juveniles outdoors for the few summer months at the end of their first winter of indoor rearing, before returning them indoors for their second year. Her unpublished photos (pers. comm., December 2008) show that her headstarted box turtles start generating carapace color when outdoors during their first year, well before ours (whose first exposure to the outdoors generally begins not till age 2 years). On-line photos of baby eastern box turtles, posted by other workers, also document instances of good carapace color appearing before 12 months (retrieved 15 July 2009 from http://www.aboxturtle.com/box_turtle_hatchling_care.htm), and before 18 months (retrieved 15 July 2009 from http://boxturtlesite.info/boxbabypics.html). Pigment production in our juveniles was evidently artificially delayed. Something in the outdoor habitat triggered their later carapace color development. De Vosjoli (1992) states that loss of color in captive box turtles (T.c.c.) "...can be partially due to a diet lacking in plant pigments" and that supplementing the diet with plant pigments helps maintain color. It is unclear if he means skin or shell color. The manufacturer of Kaytee Land Turtle Fortified Daily Food®, however, specifically claims that their food contains "...special plant ingredients which provide the nutrients necessary for excellent shell color..." (retrieved 15 July 2009 from http://www.amazon.com/gp/product/B00068K2AE). Statements like those suggested to us that the remarkable color change that we see after our juveniles are released might be due to their change to a wild diet. But understanding of carapace pigmentation physiology is rudimentary as noted by Rowe et al. (2006a) who state: "While we cannot rule out dietary influences on color variation, we know of no instances where variation in dietary composition has been shown to cause variation in pigmentation of reptiles". Our findings below agree; they do not support a dietary hypothesis. Rather, they suggest that sunlight has direct and localized effects on cells (chromatophores? paracrine cells? ), or on pigment precursors, that require many months before generating the more distinct yellows and browns, as well as intensification of the black markings, that eventually appear in the carapaces of our released juveniles. Although our indoor headstarting light was provided by "full spectrum" (10% UVB [310 nm]; 50% UVA [360 nm]) LumichromeXX bulbs (Belzer and Seibert 2007b), it evidently failed to replicate sunlight. All box turtles in our study populations carry a dome-shaped cap (Figs. 1B, 2B, 4B, and 10C) which houses the turtle's radiotransmitter (Belzer and Seibert 2009b). We were surprised, when the first occasion arrived for us to lift the cap and replace the transmitter on our juveniles, to discover that the cap-shaded portion of each juvenile's carapace had failed to produce the color and pattern enhancements appearing in contiguous sun-exposed areas (Figs. 4C, 5B, 6B, 7B, and 10D). The coloration boundaries between sun-exposed and shaded portions of the carapace were rather sharply defined. Presumably, a dietary stimulation of color production would have been systemic and would not have ended at the sun-exposure border. These findings argue that the color which develops in our headstarted juveniles after they enter a natural environment requires direct exposure to sun, and is not a systemic aftermath of newly accessed forage. As a test of the sun-exposure hypothesis, we removed the transmitters and caps from some of our juveniles for a few years to see if the previously shaded zones that were deficient in pigment would generate color once they received direct sun. They did, as is seen in Figs. 8B, 8C, 9D, and 10F. Our finding of deficient pigment production in shaded regions of carapace might have been an artifact of some factor, other than shade, associated with the presence of a transmitter cap. Perhaps dead vegetation (or even the transmitter) lodged under the cap emitted tannins or other chemicals that stained the scute to create a misleading appearance of deficient pigmentation, or exerted direct chemical interference with pigment production. But those hypotheses would not account for the delay in pigment generation (particularly during the second year) while our juveniles were indoors, before a transmitter housing was ever affixed to the carapace. And they would not seem able to account for the sharp color demarcation between shaded and exposed regions. We believe that the direct sunlight hypothesis is a better explanation of available data. The juvenile seen in [Fig. 4 ] is unusual in that he started to produce some (if only a little) yellowish pigment before he was exposed to sun (Fig. 4A). Because of that initial coloration, his photo in Fig. 4C reveals that the shaded region under his transmitter cap subsequently lost that early pigmentation over a period of 2 years. Belzer (1997) had found that no such color loss occurred in adults who carried transmitter housings for as long as 5 years. The situation exhibited by the juvenile in Fig. 4 prompted us to revisit the phenomenon in adult box turtles. Recent examination of adults in our study populations revealed that adults do (eventually) suffer some (if relatively slight) color loss in sun-blocked carapace regions. Their color-loss is very slow, requiring an absence of sun exposure that approaches a decade, especially in older adults. The relatively young (ca. 20-40 years) male in Fig. 11 shows mild, but obvious, carapace color loss in the region that was shaded by his transmitter housing for 7 years. Examination of older adults, on the other hand, found no noticeable color loss in such shaded zones till after 7 or more years of carrying a transmitter. But by 9 or 10 years without sun, some of the color had started to fade. The female in Fig. 12 exhibits an almost imperceptible (no?) color loss in her (8-year shaded) first right pleural area between the transmitter flaps, when compared to adjacent, non-shaded scutes. The dorsal regions of the first and second right pleural scutes of the female in Fig. 13 had been shaded by her transmitter cap for 10.5 years when this photo was taken. Examination of those regions shaded by her transmitter cap reveals an almost imperceptible color loss when compared to the adjacent, sun exposed, areas of the first vertebral scute and ventral edges of the first and second right pleural scutes. The first right pleural scute of the female shown in Fig. 14 had been shaded by her transmitter cap for 12 years. A slight color loss is noticeable in that scute. Fig. 15 shows a different female whose first right pleural scute had also been shaded by a transmitter cap for 12 years. The color loss in her case is a little more noticeable. Fig. 16 shows a male whose second vertebral scute had been shaded by his transmitter cap for 14.5 years. The color loss in that shaded scute is rather slight. The male in Fig. 17 has been in our telemetered study population longer than any other turtle. His second vertebral scute had been shaded by a transmitter housing for 15 years when we took the photograph. Although the shaded scute exhibits a more obvious color loss, his color pattern is still pronounced. When we examined this male a decade earlier (reported in Belzer 1997) we found no color loss under his transmitter cap during the first 5 years of shade. Finding that there is considerable delay before color starts to fade in older adults (compared to younger adults and juveniles) suggests to us that if carapace color has developed and has been well established in an eastern box turtle carapace for many years, then the pigment has a much longer half-life, after it is blocked from direct sun, than does the newer carapace pigment of younger animals. Cooper and Greenberg (1992), and Rowe at al. (2006a, 2006b), survey the fragmentary knowledge of physiological and morphological color changes found in various reptiles. The mechanisms that they describe involve time spans of minutes to months, and many employ systemic mediators. The color changes that we report here for juvenile (80 individuals), as well as adult (30 of which were examined for this report) box turtles, do not appear to involve systemic mediators, and fall outside the temporal parameters of mechanisms so far described for chelonians. Elucidating the cellular and chemical mediators, and mechanisms, of these slow color changes will likely require laboratory study. We are deeply indebted to the dozens of volunteers (too numerous to name here) who kindly headstarted the juvenile box turtles involved in our field studies. We thank Kathy Michell for sharing unpublished data. We thank the owners of the large nature sanctuary where we work for their generous permission to conduct our studies. Without their enabling these long-term studies within their large land holding, much of the insight we are gaining into box turtle biology and ecology would have been impossible. We thank Edward Reindle for kindly performing high resolution scans of prints from photographs taken before we had digital cameras. Our long-term field investigations are enabled by a special scientific permit first issued to us in 1993 by the Pennsylvania Fish and Boat Commission. Belzer, W.R. 1997. Observations on superficial turtle scute condition after prolonged covering by PC-7 epoxy. Bulletin of the Association of Reptilian and Amphibian Veterinarians 7:7-8. Belzer, W.R., and S. Seibert. 2007a. Long term movement histories for headstarted and translocated adult and juvenile Eastern Box Turtles in NW Pennsylvania sanctuaries. Third Box Turtle Conservation Workshop, November 9-10, 2007, Patuxent Wildlife Research Center, Laurel, MD. retrieved 15 July 2009 from http://www.boxturtlesintrouble.org/abstracts.html. Belzer, W.R., and S. Seibert. 2007b. Variable production of annual growth rings by juvenile chelonians. Turtle and Tortoise Newsletter 11:10-13. Belzer, W.R., and S. Seibert. 2009a. How do male box turtles find mates? Turtle and Tortoise Newsletter 13:11-21. Belzer, W., and S. Seibert. 2009b. A transmitter attachment method for terrestrial turtles, designed to protect the radio module from mammalian chewing. Turtle and Tortoise Newsletter 14:18-21.
de Vosjoli, Phillippe 1991. The General Care and Maintenance of Box Turtles. 36 pp. Advanced Vivarium Systems, Lakeside, CA. Rowe, J.W., D.L. Clark, and M. Porter. 2006a. Shell color variation of Midland Painted Turtles (Chrysemys picta marginata) living in habitats with variable substrate colors. Herpetology Review 37:293-298. Yahner, R.H. 1974. 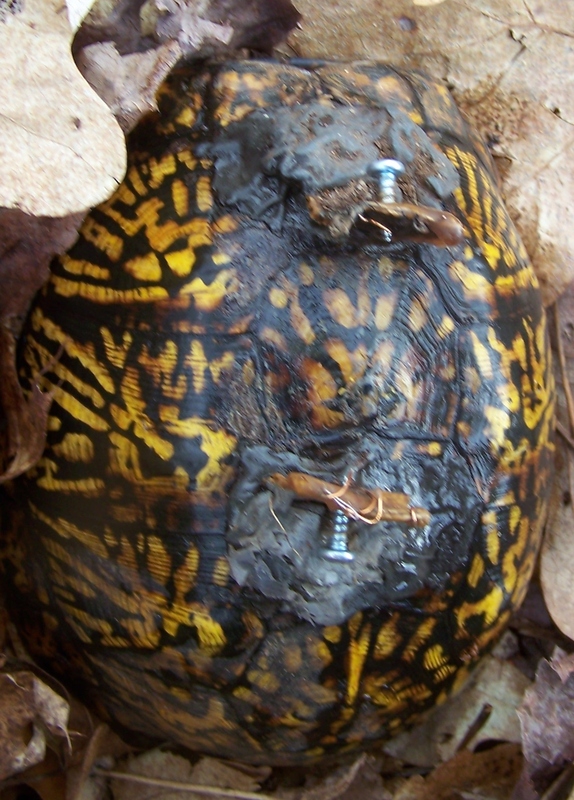 Weight change, survival rate and home range change in the box turtle, Terrapene carolina. Copeia 1974:546-548. Text, graphics, and HTML code are Copyright © 2010 Philadelphia Herpetological Society, Inc. or their respective owners. All rights reserved.